I’m taking a break on posting to this blog. I’ve received a few queries about this so for any interested in more detail link here. You can also get to the page from the link “Blog Status Update” in the sidebar. I recently updated the page with some additional information. 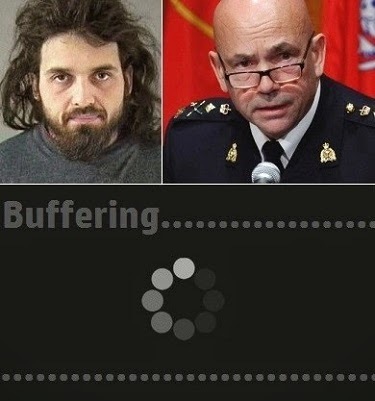 After we were told the video made by Ottawa shooter Michael Zehaf-Bibeau would be made available to the public, the RCMP has changed its mind, or had it changed for them. RCMP commissioner Bob Paulson wasn’t exactly clear on the specifics. He said there may be a release of “some aspects of a transcript of the video”… whatever that means. Given the terrorist narrative favored by the government and also by the police, how can the public be sure that ‘aspects of the transcript’ aren’t cherry picked to reenforce the preferred narrative. Surely the honest and transparent thing to do would be to release the video for the public to make its own judgment or alternatively release the entire transcript, rather than “aspects” of it. If as some claim, there are concerns about the video being exploited in some way for jihadi propaganda, the odds of that happening would be diminished considerably if a transcript was involved – cop out though that would still be – because there is no compelling reason to sit on the video. There are any number of jihad-inspired videos in circulation that glorify jihad and attack the West… lots of audio-visual incentive out there for anyone influenced by such material. The release of Zehaf-Bibeau’s video – assuming it contains any such content – would not likely make a substantial difference one way or another. In giving reasons for withholding the video, Paulson also made vague allusions to “some sort of court process.” But given what we know this doesn’t add up. Zehaf-Bibeau is dead and there were no known accomplices. The decision to withhold the video seems to be more about political calculations. Perhaps Harper is concerned that the video’s contents might in some way influence public opinion about Canada’s involvement in the US-led war in the Middle East… part of the government’s deeply misguided foreign policy agenda. There has been some debate in parliament about whether or not the term “terrorism” should be used in describing Zehaf-Bibeau’s actions. But from the outset it was clear that the government was dead set on labeling it a “terrorist attack” despite information about Zehaf-Bibeau’s past that indicate mental and emotional problems were a likely trigger. According to a recent poll Susan Bibeau’s view is shared by a high percentage of Canadians … while 36% describe the shooting as a “terrorist attack” 38% believe mental illness played a part in it. Although the Harper government has been careful not to appear to be chaffing at the bit to beef up enforcement powers in the wake of the attack… given the reactionary right-wing nature of this government you can be sure it wants to extract as much mileage as possible from the incident. The wheels are apparently in motion. On Monday a Commons committee passed Bill C-44 that hands additional powers to the Canadian Security Intelligence Service (CSIS). According to Public Safety Minister Steven Blaney, another bill is in the works that will boost law enforcement powers in the areas of surveillance, detention and arrest. It’s hard to imagine a scenario in which any world power would deliberately start a nuclear war given the dire consequence for the planet. Rational thinking and the will to survive prevents us from believing that any nation… any leader… could be crazy enough to intentionally unleash what could wind up being a terminal war of reciprocal destruction. But what is often overlooked is the increasing likelihood that a nuclear war might well be started by accident. The worst-case scenario, of course, would be a nuclear war, which would be terrible. Both states that initiate it will be wiped out by the consequences. That’s the worst-case. And it’s come ominously close several times in the past, dramatically close. And it could happen again, but not planned, but just by the accidental interactions that take place – that has almost happened. It’s worth remembering that just one century ago, the First World War broke out through a series of such accidental interchanges. The First World War was horrifying enough, but the current reenactment of it means the end of the human race. Chomsky’s reference to a nuclear war begun ‘by accident’ makes sense when you look at how this might come about. An escalation factor might be faulty intelligence, leading for example to a mistaken belief that the other side is planning an imminent nuclear strike. The decision may then be taken to use tactical nuclear weapons in order to seize first-strike advantage. Underlying intelligence failure of this sort could be a more general strategic misreading of the enemies’ intent and other communications failures that fuel a pattern of escalation. A report entitled Towards a Grand Strategy for an Uncertain World: Renewing Transatlantic Partnership lays out a new vision for the NATO alliance. It contains a number of statements that confirm the importance of nuclear weapons “in the quiver of escalation”… ostensibly to prevent “existential dangers.” But in fact their use is also clearly about maintaining a winning edge however couched in the language of prevention, as this statement from the report suggests: “What is needed is a policy of deterrence by proactive denial, in which preemption is a form of reaction when a threat is imminent, and prevention is the attempt to regain the initiative in order to end the conflict.” Tactical nuclear weapons are very much a part of any so-called “proportional” response. This scenario opens the door for all kinds of potential disaster. Tactical or non-strategic nuclear weapons are now part of the toolkit of the world’s major militaries. These weapons can be calibrated to suit the challenges on hand. Variable yield allows operators to set the weapons’ explosive power in consideration of target and conditions. Small-yield tactical nukes might encourage preemptive strikes especially if a conventional force is facing defeat. They may be used in other ways to seize the advantage. Under war conditions the step from tactical to strategic nuclear weapons might not be such a huge leap, especially on the part of a military staring down the barrel of defeat. We can think back as far as 1955, when Bertrand Russell and Albert Einstein produced an appeal, a joint appeal to the people of the world, in which they said to all of us, you have a choice that is stark, unavoidable, the question is, will you eliminate war or will you eliminate human race? These are your choices. 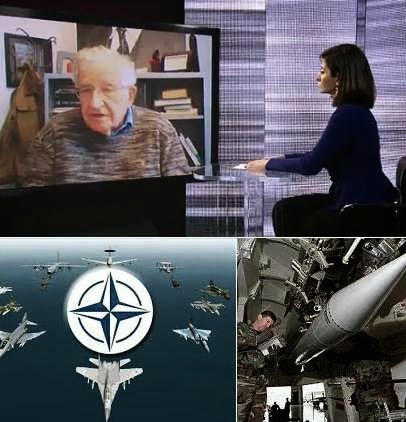 The demonization of Russia in Western media and the toxic cold war-like environment that is being whipped up is driven by geopolitical ambitions, energy and resource considerations and a very particular animus toward a major global power that is unwilling to alter its long held values and traditions. This offends some people, who over and above the larger geopolitical considerations, appear willing to risk heightening an already tense situation in the course of pressing a Western-centric rights agenda. This is a two-part post dealing with resistance to the Israeli occupation. 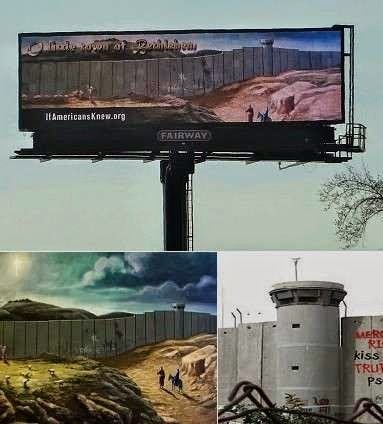 The common thread is Christian-related… in one case billboard art with a controversial slant on the the nativity story and in another the growing evangelical resistance to Israeli occupation. Bethlehem today is a far cry from the biblical version revisited in Christmas pageants. The present day version is ringed with security, not unlike a barricaded fortress. On ifAmericanslknew.org there is also this commentary about the brutal political and social realities underlying the Banksy mural. Security structures, even Israeli ones, can’t suppress creativity. The West Bank wall features some impressive artwork. 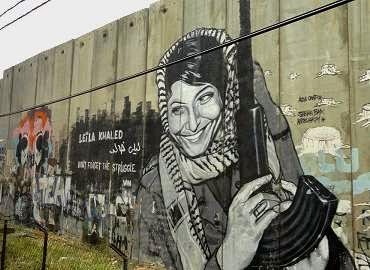 Along with spontaneous graffiti there are murals with themes of resistance… for example this mural of the famous Palestinian freedom fighter Leila Khalid. 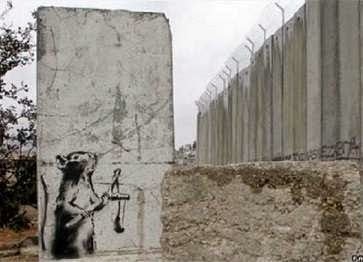 The mural of Joseph and Mary beneath the West Bank wall is just one of a number of murals by Banksy that deal with Palestinian themes. 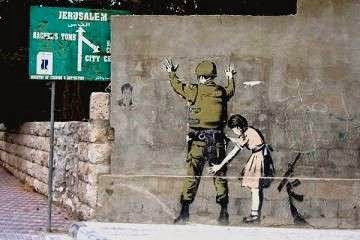 During time spent in Palestine, he produced a number of murals including some on or near the West Bank wall. Beneath are a few examples of his work… view others here. The Atlanta billboard graphically exposes the brutal reality of Israeli occupation. Although there is no publicly stated connection with evangelical activism, the Christian-themed billboard art appears at a time when many American evangelicals have been openly questioning the unconditional allegiance that their churches have traditionally given to Israel. A number of influential evangelical leaders have been looking more critically at the dehumanizing reality of Israeli occupation, with a number stepping up and expressing solidarity with the Palestinian people. This is a development that hasn’t gone unnoticed by Christian Zionist organizations such as Christians United for Israel (CUFI). Its executive director, David Borg, recently made a statement that acknowledges a profound change in the position taken by increasing numbers of evangelicals on the subject of Israel. The term “anti-Israel” used by Borg might be considered misleading. Activists I read and likely those also of Christian evangelical persuasion are challenging the system of occupation and systematized oppression that has evolved from a great historical injustice. This is quite different from an anti-Israel position that for example calls for the destruction of the state. More about the goals of the conference here. There is also this in-depth article about the conference posted on the Israeli news website 972 Mag. The increasingly reactionary, racist and militaristic Israeli state presents a moral dilemma – and not only for evangelical Christians. Religious Jews, particularly of the Orthodox persuasion, understand that tying their identity to Israel involves compromise… a compromise many aren’t prepared to make. The impact of Zionism on Jewish identity is powerfully addressed by Yakov M. Rabkin – Professor of History at the University of Montreal – in his book Threat Within: A Century of Jewish Opposition to Zionism. Worse than the toll of suffering, exploitation, death, and desecration of the Torah, has been the inner rot that Zionism has injected into the Jewish soul. It has dug deep into the essence of being a Jew … It has wreaked havoc among Jews both in Israel and America, by casting us in the role of Goliath-like oppressors. It has made cruelty and corruption the norm for its followers.